Why did Wish send me a push notification promoting an illegal weapon? Valued at almost $8.5 billion, Wish is one of the fastest growing e-commerce startups, connecting consumers in the West with vendors and manufacturers in China. It sells a variety of products, from clothing to electronics, all at bargain basement prices. Some of the wares flogged on Wish are a little less legal than others. I know that because last night, the Wish app sent me a push notification informing me of a sale on stun guns. It's absolutely bananas that I just got a push notification from @WishShopping promoting weapons that are prohibited in the UK. In the UK, where I’m based, stun guns — like conventional firearms — are classified as offensive weapons and are prohibited under law. Possession alone can land you a lengthy custodial sentence, with a maximum prison term of ten years. In January this year, a Port Talbot man was sentenced to five years in jail after the stun gun he bought online was intercepted by customs. A few months later, two Newcastle men were jailed for 20 months each after they imported stun guns that were disguised as iPhones. So, to recap, Wish sent a push notification to my phone inviting me to buy something that could earn me a decade in the slammer. Nice. To be clear, I’m not debating whether this is right. I know some of our American readers feel strongly about the so-called “right to bear arms.” I’m more interested in how Wish could allow itself to advertise a product to me that’s highly illegal in my country. Wish is no fly-by-night operation. So far, it’s raised $1.3 billion from a swathe of desirable VC firms, including Founders Fund and DST Global. You would hope that at least one person in its employ would be familiar with the laws in the countries that it serves. 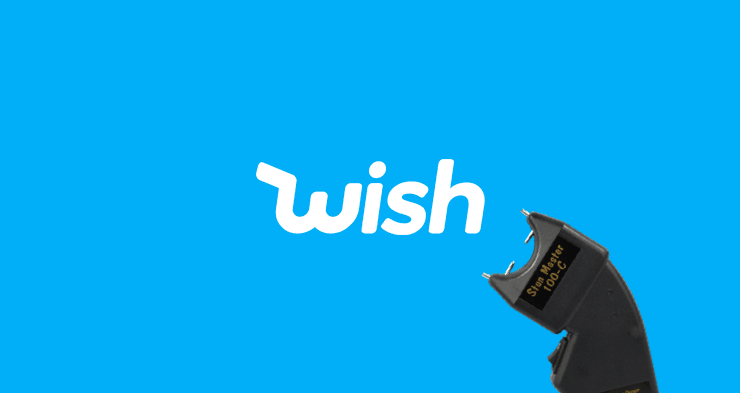 Based in San Francisco, and with most of its products mailed directly from China, it’s unlikely that Wish itself will find itself in hot water for advertising illegal offensive weapons. Instead, it’s the UK-based punters who risk legal peril. TNW reached out to Wish for comment on this story. At the time of publication, they’re yet to reply. If we hear back from them, we’ll update this post.